Let me just say that I know my pick of the week is late. That's okay because it was Wrestlemania weekend so cut me some slack. Okay back to the comics, this book has been so much fun. 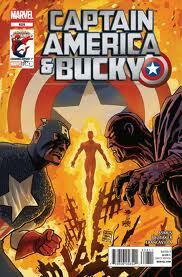 This issue I picked is the conclusion of the second storyline in Cap and Bucky. It involves Fred Davis, a man who served in the second World War as Bucky when everyone thought the real Bucky had been killed. Fred and the also new replacement Captain America, William Naslund, take up the mantle of heroes but are never recognized because at the time the information was all very top secret. A man posing as the grandson of William Naslund shows up and turns out to be an android assassin. The younger Naslund's personality is overwritten by the main villain who is the same android who killed the 1940's Captain America. Cap teams up with another android from the past, the original Human Torch, which I found to be a nice little throwback to Golden Age Marvel Comics. The super evil android now known as Adam III takes the form of the Captain America we all know and love and with his connections in the government tried to use U.S. missiles to take out all life on the planet. While Captain America is down along with The Human Torch making the save to destroy Adam III back up Bucky makes the game winning play. He has the android who was working with Adam III locked up by Military Police (this android was a US General). The best part is the bit of gratitude that is showed to Fred Davis. He spent his whole life knowing that he was a hero during the closing days of World War II but was never able to speak about it. I loved how at the end Captain America has a giant statue erected in honor of William Naslund and Fred for their selfless service to the United States. I loved the writing on the book and was really becoming a fan of the creative team. I felt they were really beginning to hit their stride. But alas it was a fitting ending to an awesome story.